Keith Gregson taught history for over thirty years and now works as a full-time family history writer and author. A regular contributor to Ancestors, Family Tree Magazine, Family History Monthly, and Your Family Tree, he is the author of Sporting Ancestors, Tracing your Northern Ancestors, A Viking in the Family and now A Tommy in the Family. The First World War was one of the deadliest conflicts in human history, the first instance of modern total war and one of the most far-reaching. As a result, almost all of us have an ancestor family who was involved in or effected by the Great War. 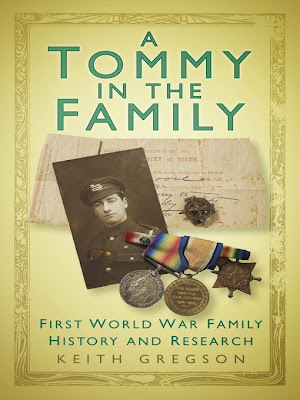 In A Tommy in the Family, Gregson explores some of the human stories behind the history of the war, from the heart-warming to the tear-jerking. He encounters the mystery of the disappearance of the Norfolks; the story of a French girl’s note in a soldier’s pocket book; and the tragic tale of a group of morris dancers who paid the ultimate price while serving their country. The investigations that preceded each discovery are explored in detail, offering an insight into how the researcher found and followed up their leads. They reveal a range of chance findings, some meticulous analysis and the keen detective qualities required of a family historian. Full of handy research tips and useful background information, A Tommy in the Family will fascinate anyone with an interest in the First World War and help them to find out more about their ancestors who participated in one of the most troubled conflicts in the history of mankind. When held up with its contemporaries, Gregsons contribution to this extensive published field is a refreshingly detailed introduction to the social history of the Great War, giving an accessible and attractively illustrated insight into what will be for the next few years, the most significant and talked about period of human history. It will be of interest to the general reader and especially local history historians of Norfolk.